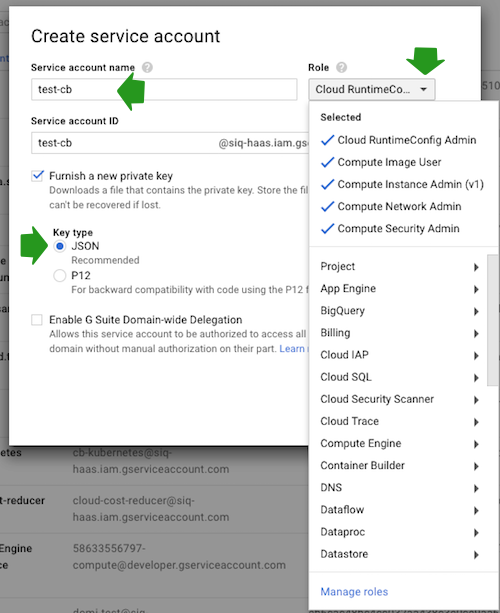 In order to launch Cloudbreak from a template, you must create a service account that has the following roles. If you already have a service account and a JSON key but you need to update the permissions for the account, you can do it from IAM & admin > IAM. If you need to create a service account, follow these steps. Enter the Service account name. This will determine your service account email. Make a note of this service account email. You will need to provide it when creating a Cloudbreak credential. Under Role, select the roles described above. Under Key type, select JSON. The JSON key will be downloaded on your machine. You will need it later to create a Cloudbreak credential.